BFSS has been supportive of the productive partnership between Computer Aid International and Computers for Schools Kenya and was keen to work with them to deliver the next stage of ICT integration in education in Kenya. Through this grant, 20 schools received significant investment in terms of training and equipment to establish themselves as centres of excellence for improving teaching and learning through the use of information and communication technology. Each school received a new computer lab consisting of 20 high quality refurbished PCs, donated by companies and organisations in the UK and refurbished by a dedicated team of London-based volunteers. 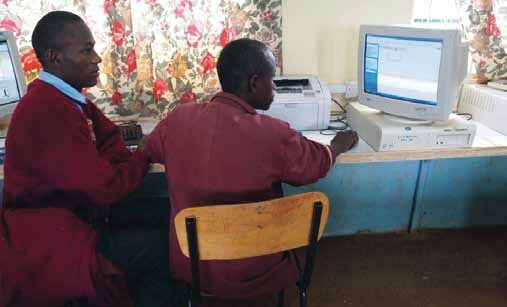 Over the expected lifetime of the equipment, an estimated 30,000 students will have access to the computers, thereby gaining essential skills and confidence to enter further education or better paid employment. In-depth training provided teachers from each school with the skills and confidence to use the equipment effectively, learning how to prepare classroom material and presentations and how to find additional resources and information online. In addition, each school was given three laptops to be used by the teachers themselves to search for information or prepare material and presentations. Each school was also given a projector so that teachers can plug in their laptops and present their pre-prepared material in front of a class quickly and easily.